How to trade with SPA Trader? Auto trading: true/false, if set true, it trades automatically, if false, semi auto. Risk management: True/false settings. If set to true, then it works for stop loss and take profit according to the ATR settings below; the lot size will be as set fixed lot size. ATR settings: ATR is our shortform for Average Trading Range of an instrument. Take the ATR Time Frame for Day and give the number of days you prefer to, it will calculated the average of the volatility of that instrument in pips, then you set the percent for profit taking 01-03 accordingly. For example: EURUSD has an average of 80 pips/day, you put 60% for Tp01, then after EURUSD moves 60%*80pips=48 pips in your favor, it will take a given XYZ % as set for Tp01 partially in % and move your stop loss to break even automatically. Tp02 taken, then trailing stop starts. 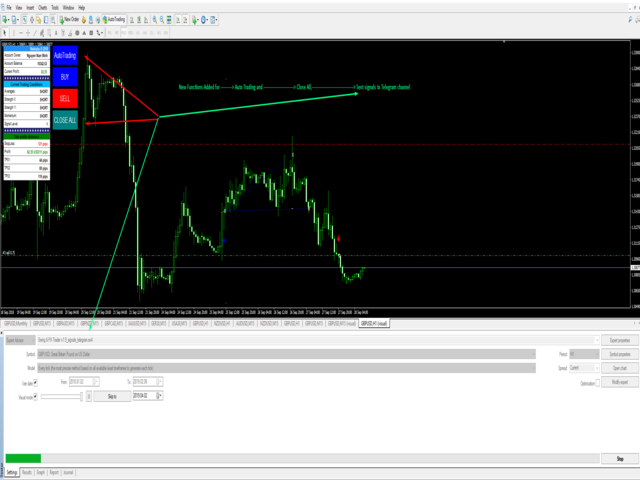 Magic Number: It helps you to trade with same product in different Time frames by putting other magic number. TF can be changed to different time frames and working on your current used time frame as well as you use the same time frame. The shortlevel and longlevel refer to the force X, for by measuring them at certain levels, then it will provide trader the signal that the current market condition is likely ups, downs or flat and the levels are encrypted in digits to chose. The shortlevel and longlevel refer to the force Y, for by measuring them at certain levels, then it will provide trader the signal that the current market condition is likely ups, downs or flat and the levels are encrypted in digits to chose. Note: The SPA Trader can work in different ways according to traders need, so we do not code as fixed but let the free space for traders to customize their actual needs. On the chart Acc will be visible and the trading conditions will be provided to trader via text such as:short/long/flat on both strengths X and Y and those strengths will be averaged accordingly to identify the best trend to trade. + New function for signal services to send trading signals to Telegram channel, visit: https://t.me/tradingscenes to see the signals we sent out. + New function for outside panel to click to change auto trade or stop auto trading; pls take note that both auto and stop auto trading still work with semi auto trading buy clicking the button Buy/Sell. + New buttons for Autotrading outside and Close all. So all opened position opened with that EA with the same magic number will close all if you click it.